A reliable wilderness survival shelter is more than just a well-insulated tent. It’s not just a good tent to use during outdoor camping (though you can, and should totally use it like that, too). It’s more like a medical-designed, military-grade shelter effective enough to protect the life of a survival victim until further help arrives. 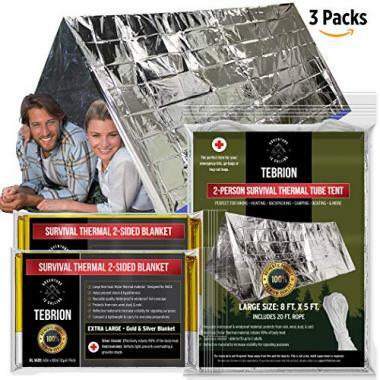 The best survival shelters you can acquire will offer emergency protection in all weather conditions, usually for 2 people, as well as a minimal supply of survival tools and design features. The fabrics that go into a wilderness shelter are capable of reflecting up to 70% of your body heat regardless of how cold it is outside the winter survival shelter. So, without further ado, here are our top 10 picks so you can choose the best shelter for survival according to your needs. This is probably the best winter survival shelter on the market. It’s made from the toughest Mylar thermal insulation fabric and it was originally designed by NASA for space exploration. Most outdoor survival shelters are only reliable the first couple of times you use them. Their fabric will feel flimsy and cheap compared to the Delmera quality standard, whereas this item can be safely reused for a long, long time. Besides the super-insulating fabric, this wilderness survival shelter is equipped with an emergency whistle and a paracord to get you out of a tight spot. When wrapped up, it packs up tightly and it’s very lightweight and easy to carry. If you’re planning to go climbing or hiking in a very cold environment, this is the best shelter for survival to take along with you. This large size thermal tent is a top-rated shelter for survival across a wide variety of emergency situations. It’s not just a reliable insulation tent for camping out in winter time, but also perfect for first aid situations and emergency victim preparation. Its large size will accommodate 2 adults comfortably, and it also comes with 20 feet of rope. It’s the best shelter for survival if you’re really going for the rough wilderness experience, due to its multi-use. 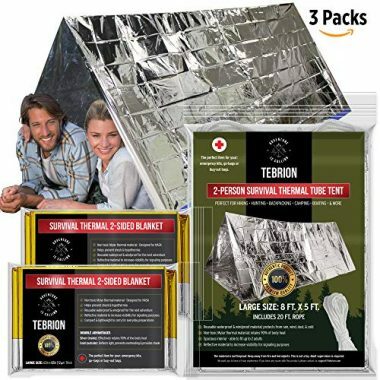 According to survival shelters reviews, this TEBRION item is one of the most versatile choices in its category. It can be used as a raincoat or a backpack protection cover, as a wind blocker or shade cover, as a rain poncho or sleeping bag liner, water collector, dust guard and much more. To make sure you make the most of it, the producers will also give you an e-book upon purchase, detailing all the ways you can use your new wilderness shelter. This is one of the most affordable outdoor survival shelters, but its quality is up to par in spite of its relatively low price. The Sharp Survival insulation tube shelter is easy to carry and set up (you can have it ready to use in a matter of minutes), and will provide perfect protection from the cold, wind and rain. There is room enough in it for two adults to be able to lay comfortably. According to survival shelters reviews, it’s an ideal option for prep kits and disaster relief kits. 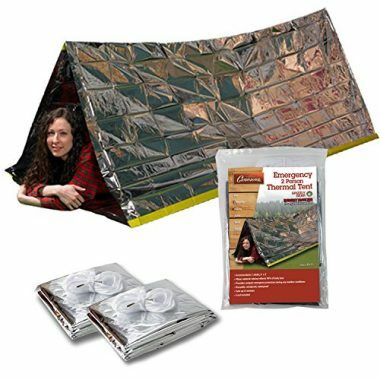 Its affordable price and the flawless insulation make it perfect for most camping and hiking trips. Still, if you’re planning an outdoor stay during very cold weather, it would be better to choose a heavier winter survival shelter, such as our first two picks above. This winter survival shelter comes from a highly rated brand, Grizzly Gear, known for its popular survival and outdoors items. Its Mylar insulation layer works to offer a flawless level of protection against water, snow, extreme cold, wind and so on. This is the same state of the art fabric designed by NASA for space exploration (which some of the other best survival shelters in our list use). Therefore, you can be sure that you’re getting the best level of protection possible. The Grizzly Gear wilderness shelter can accommodate two adults in its 8’X3’ inner space. The top notch fabric and design make it also suitable for secondary uses, such as signaling, emergency sleeping bag, water collector, sun shade and so on. Packs up in a compact and lightweight bag, so you can easily take it anywhere with you. 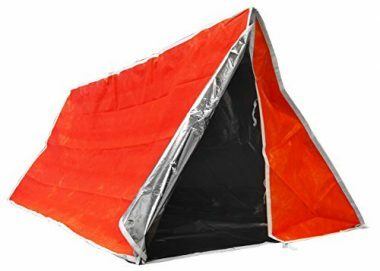 This brightly colored orange wilderness shelter is a great choice for one person preparing to camp out in unpredictable landscapes. With it in your backpack, you can easily set out a camping area and get comfortable inside it in a matter of minutes. Even if the ground is frozen, or if there’s no actual ground to camp out on, but just a rocky landscape. As long as you have this winter survival shelter and a good sleeping bag, you’re good. Ultra-light and easy to use, this insulating tube tent for two people is a state-of-the-art Mylar product. Designed by NASA, as mentioned above, the Mylar fabric is considered by experts the most highly performant insulation material currently known. 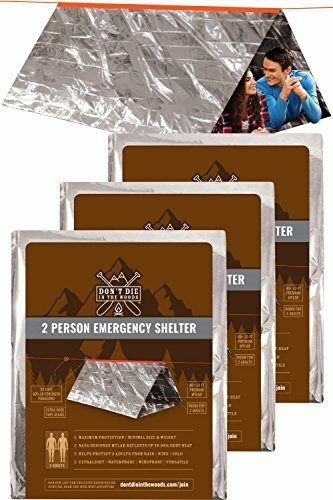 This affordable option can help two people get cozy on any camping trip, especially because of the two emergency blankets you will receive with the purchase. The wilderness shelter tent is very sturdy, being made with industrial strength rope and reinforced seams. The producers jokingly describe this product as being reliable even as part of a zombie survival kit, but joking aside, it’s true that the product is very versatile. You can keep these tents stashed anywhere on hand as part of emergency preparedness, and take them with you on all camping trips. 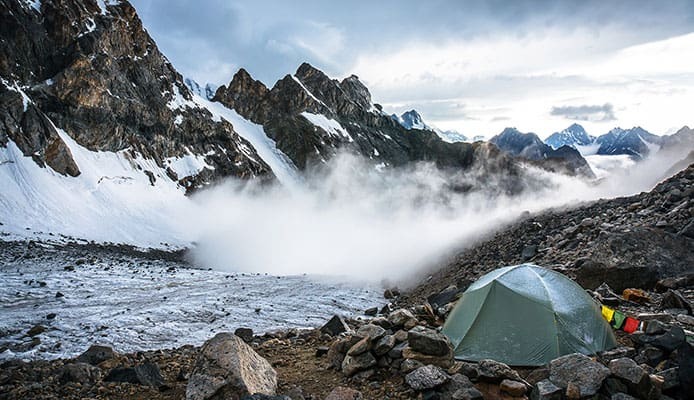 This cleverly-named wilderness survival shelter is dubbed the second toughest because the producers prefer their pro version of the tent as the official toughest. Still, for the needs of a regular camper, this one will be more than enough. Especially if you have little space in your backpack, this is the best shelter for survival when you can’t carry a lot. It will offer you ideal protection from the elements, especially from the cold, making it a great winter survival shelter. 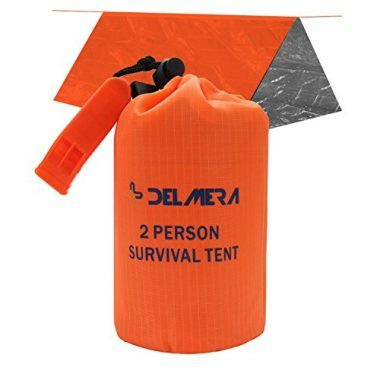 It’s big enough to fit two people snuggling up in the campsite, and you can set it up fairly easily, using rocks or heavy objects to anchor it. Alternatively, you can also tie it up between two trees. The string rope that unravels the wilderness shelter tent is a very sturdy rope, unlike other models which come with a flimsy string. This top-rated shelter for survival is very compact, but solid and reliable. It is made from a fireproof material that can protect you from this kind of danger as well, in addition to being waterproof and insulating. This type of material is also much better for heat insulation compared to aluminum-based outdoor survival shelters. It’s easy to set up with 4 iron buckles and 4 plastic stakes, and you can have it ready to use in just a few minutes. One person can comfortably fit in it. The wilderness shelter created by Lyn also has the advantage of being silent. If you’re usually put off by the rustling noise that aluminum-based outdoor survival shelters can produce, rest assured that this one won’t bother you. This affordable and simple option isn’t the best shelter for survival if you’re looking for a heavy-duty option, but it’s good enough for short camping trips in the warm season. It’s based on polyethylene, just like most ground covers to be placed under your sleeping bag. It can accommodate two people and it doubles down as a rain cover or groundcover. Still, it’s not reusable, so it’s best placed in an emergency preparedness kit that contains other protective items as well. 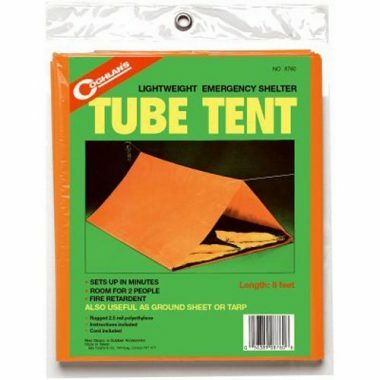 The wilderness shelter isn’t advertised specifically as single use, but most reviewers advise you not to expect too much durability out of it. A nice perk though is its fire-retardant layer. 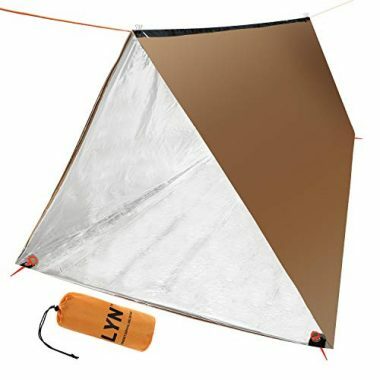 A lightweight wilderness shelter, this thermal tent from Wealers is great to use in most camping trips, as long as it doesn’t get too cold. 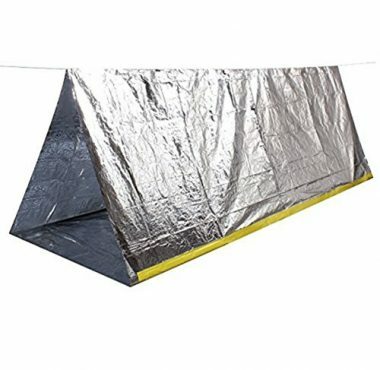 If you’re looking for a reliable winter survival shelter, a Mylar-based tent is probably a better option since it insulates better. This one will only guarantee preserving 80% of your body heat, so for wintertime one of the sturdier options above would make a better choice. The options in this list of the best survival shelter seem to differ from one another quite a lot, right? Here is what you should be looking at depending on your needs. If you plan to take hiking trips in more dangerous and remote areas, or during wintertime, you shouldn’t settle for anything less than Mylar. Aluminum-based ones or alternatives are then the middle level, and polyethylene is the lightest type of fabric to consider. For colder conditions, you should be looking at the best survival shelters, capable of preserving 90% of your body heat. If you’re camping out in regular environments during spring, summer and fall then an 80% protection rate will be enough. Waterproof is a must, but all of the outdoor survival shelters on this list provide this feature. If you plan to use a campfire right next to your tent, then you should also look for a fire-proof one. As you can predict, some of the more expensive options in our top are also more durable. Polyethylene is the least durable material, and Mylar is the most resistant. Still, you should look to other factors too when assessing durability (the strength of the rope or string holding it together), the toughness of the seams and so on. Q: How Do I Make Sure I Get The Protection I Need? A: The best way to get heat insulation and weather protection is by using a reliable wilderness survival shelter inside a regular tent made for camping. A survival shelter is much smaller than a classic tent in any case, so it would perfectly fit inside one. Also, just like you protect your sleeping bag from the ground’s cold by adding an insulation layer between the sleeping bag and the tent, you will also protect yourself even better by using a wilderness shelter. Of course, the protection offered is not just about the cold, but much more than that (other types of temperatures or weather conditions etc., not to mention the paracord rope and emergency whistle included with some models). Before you get inside the survival shelter you need, it needs to be well-grounded. Some models come with a paracord rope, such as the one you can find in survival bracelets. You are supposed to use this rope for tying the outdoors shelter to a large and heavy object before it’s ready to use. Others come with specialized steel tent pegs for an even more secure grounding. We lean towards the second type of grounding system (using tent pegs), but that doesn’t mean the rope method is not trustworthy either, as long as the item you buy is high-quality. Q: How Do I Store And Use My Survival Shelter? A: This will be the least of your worries once you make up your mind about what wilderness survival shelter to choose. All of the best ones are very lightweight and come in a case which you can use to carry them around, tightly packed. While you’re not gone camping, you can keep your wilderness shelter in a storage closet around your home, or even in a shed outside the home. 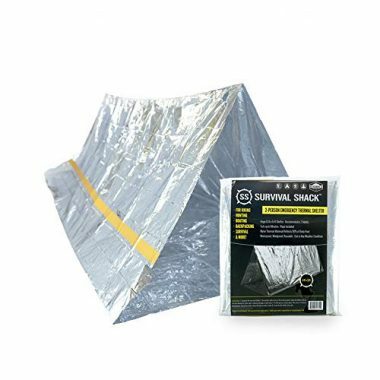 Using your survival shelter is fairly easy and straightforward, especially if you take a look at the instructions leaflet which will come with your purchase. Some of the best survival shelters also come with multi-use features, and in these cases you will of course have even more instructions (like an e-book, for example) in order to make the most of it. Camping outdoors is a wonderful and exciting experience that everyone should have regularly. As long as you follow some basic safety rules and you come well prepared and well-equipped, it will be nothing but pleasant. Choosing a good option from among the best survival shelters available is part of this preparation process, of course. We hope that we managed to give you a glimpse of the features you should be looking for, and that you’ll have a great time in your wilderness trip. 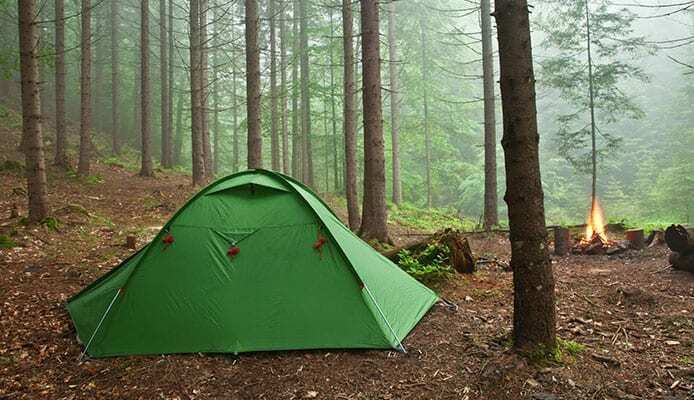 Outdoor Camping Safety Tips for Winter Weather, CDC.gov. Survival Skills 101: Everything You Need to Know to Get Out of Trouble Fast, CSUSTAN.edu. Have you been camping or hiking during winter or extreme conditions, requiring the use of a wilderness survival shelter? Do you just take one along on any camping trip or do you actually use one on a regular basis? What’s the best survival shelter you’ve tried out so far and where do you plan to take it next? Share your thoughts and experiences with our other readers below! We’re always happy to hear from you.